A robot football match being hosted next week could provide solutions to real world problems, as well as showcasing British robotic talent. The first National Student Robot Football Championship will see bot teams show off their skills ahead of the European Championships in June. The event is being held on 5-6 April at the University of Warwick, Coventry. "All of the real world control problems of industrial robots exist in this game," said Warwick's Dr Ken Young. "It gives students an ideal platform on which to build solutions," said Dr Young, who is head of the British Automation and Robot Association (Bara). Only two teams from the universities of Warwick and Plymouth are taking part in the tournament. Engineering students from three other teaching institutions are attending as observers, in the hope that they might be able to compete next year. Robotic football is still very much in its infancy in the UK due to the challenges of producing a team of robots capable of working together in real-time. "It is a very difficult thing to come up with a cross between artificial intelligence and robotics," said Caroline Browne, one of the engineering students who worked on the Warwick bots. "There are so many things that could go wrong with it that people get very frustrated," she told BBC News Online. She has worked with five other fourth-year engineering students since October to develop Warwick's squad, called Team Evolution. With a budget of only £800, they have had to rely heavily on sponsorship and their own abilities. 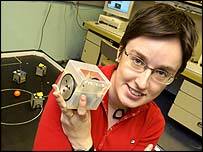 Both the Plymouth and Warwick teams will be heading for Germany in June for the technology equivalent of Euro 2004. They will be among 14 teams from 11 countries taking part in the European Robot Soccer Championships. The question is whether the Warwick's bot squad has got what it takes to bring home the cup. "We're not quite there yet," admitted Ms Browne. "We certainly won't disgrace ourselves but we are one of the more recent teams in the championship." 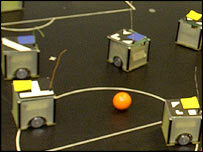 For the matches at Warwick, two teams of five autonomous robots try to score as many goals as possible in the 10-minute matches. It is a far cry from being able to take on the like of Beckham on the football pitch. "Researchers in artificial intelligence and robotics set the challenge of developing a team of football-playing robots capable of beating humans by 2050," said Dr Young. "There's still a long way to go before the world's footballing robots are up to the 2050 challenge, but tournaments promote autonomous robot development and facilitate ideas exchange to further the robotics industry."